This lovely salad really shouts green and healthy! Remove the hard woody part of the stems of the asparagus. Cut the asparagus in thirds. Kook the asparagus in boiling water with a bit of salt for about 5 minutes or until cooked al dente. Pour off the water and plunge the asparagus into cold water to stop the cooking process. 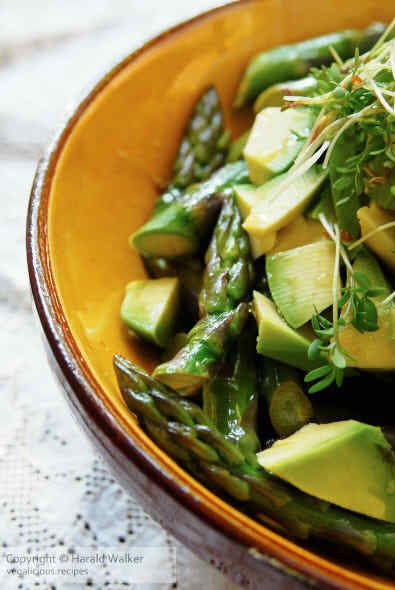 Pour off the cold water and place the asparagus in a bowl. Cut the sugar snap pea pods in half. Cook them in boiling salted water for 3-5 minutes. Pour the water off and plunge the pea pods in cold water. Add the pea pods to the asparagus. Peel the avocado, cut in half and remove the nut. Cut the avocado in bite sized pieces, into a bowl with lemon juice. Heat the oil, and bake the asparagus and sugar snaps to re-warm them. Add the sliced scallions and mix all together. Place the warm vegetables in a serving bowl. Warm the salald dressing and wish the ingredients together. Put the avocado pieces as the top layer over the warm vegetables. Pour the salad dressing over the vegetables and garnish with the spouts. It’s enough to be a light meal for two, with a nice whole grain bread on the side. Posted by Chris Walker on May 21, 2007 in Asparagus, Avocado, Ingredients, Meals, Salads.